I’ve had 1/2 cup of leftover rice in the fridge since last Saturday. I had 1/3 bunch of dill beginning to yellow at the tips and same with cilantro. I added a handful of parsley and I had 1 1/2 cups chopped herbs. I put some oil in a skillet, heated the rice, scooted it to one side, cracked an egg in. Then I took out the egg, turned off the burner and stirred the herbs and a few pinches of salt into the warm rice. The whole thing went into a bowl, topped with egg and Sriracha. Perfect lunch on a hot day! 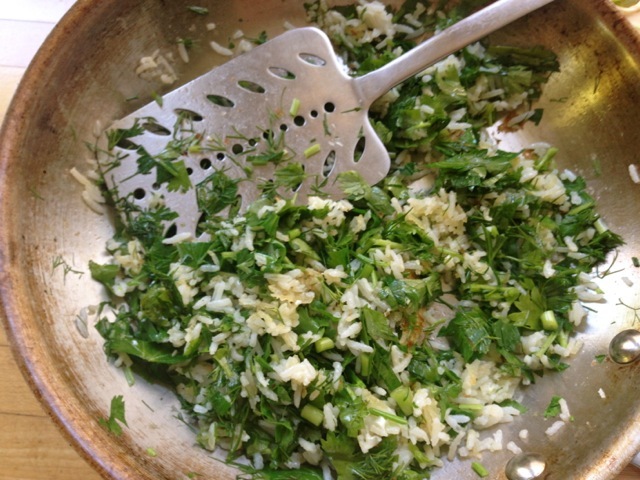 That ratio of herbs to rice was inspired by Sabzi polo the Iranian dish with loads of herbs and rice. This is my 5-minute, totally oversimplified version. You could easily scale this up for more people. 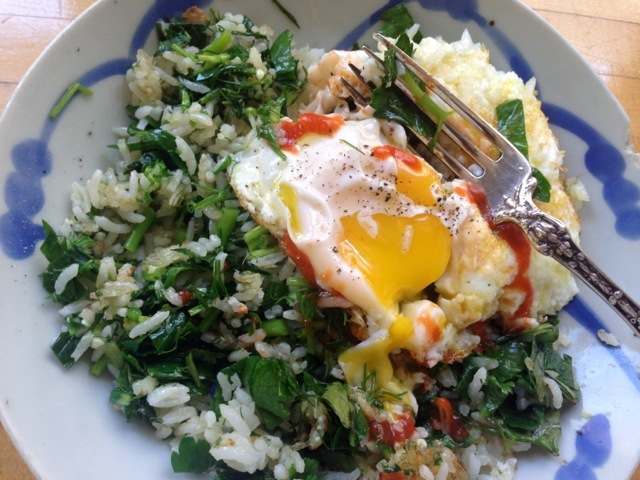 Leftover rice, like for any fried rice, will work much better than fresh. Freshly cooked rice will be too sticky. I always cook twice as much rice as I need and freeze the rest to use for dishes such as these. And now two containers of things needing to be used are no more. Waste not, want not! “Interesting combination” said the eight-year-old, . . . “fantastic” said the husband, helping himself to thirds. “It’s worth repeating”, said the cook. . . who enjoyed the leftovers for breakfast this morning. 3 tangerines or clementines, 1-2 oranges (or whatever similar citrus fruit you have), broken into sections and cut in half, crosswise. If you want to be fancy and are using oranges you can peel the whole orange with a sharp knife, including all the pith, and then slice out all the individual sections carefully along the skin on both sides of the section, leaving only the skin and core on the cutting board. But this really isn’t a fancy salad so I’d say skip it! Put the quinoa in a pot with the water and some salt. Bring to a boil, turn down to a simmer and cook, covered, on low heat for about 15 minutes or until the water is absorbed and the quinoa is tender. Let sit, covered, with the heat off to steam for at least 5 minutes if you can. 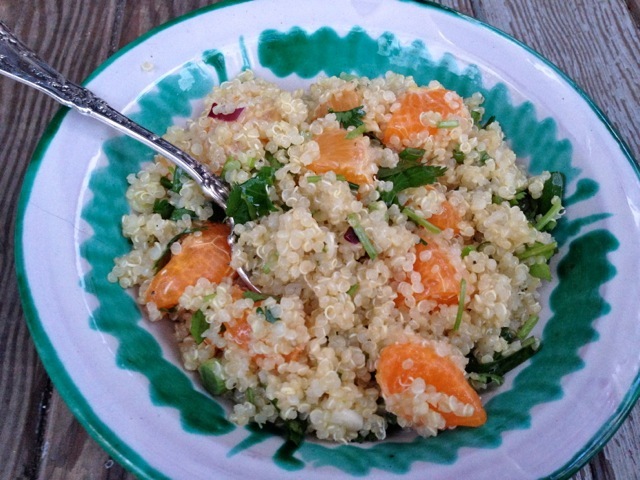 Then put the quinoa in a salad bowl and toss in the tangerines, Let cool for a few minutes. Then add the remaining ingredients. Toss and taste and adjust seasoning with lime juice, oil, etc. If I’d had toasted filberts (or walnuts or pine nuts) on hand I would have added some and am quite certain that this would be a lovely addition. Please report if you add nuts! 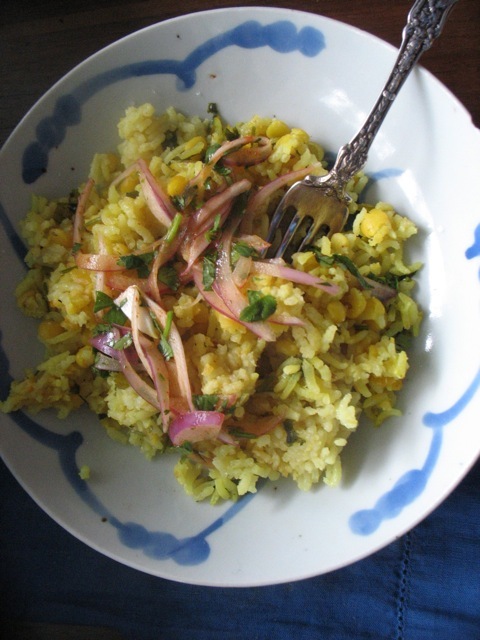 Split yellow peas and basmati rice cooked with cumin seeds, turmeric, Garam Masala and cilantro and topped with a spicy, lemony onion relish. One of the best things about living in this era is that we can experience so much of the world through food and the people who share it wherever they end up. What began with the Spice Trade as much as 2500 years ago and continues in varied forms today is a global exchange of flavors, cultures, and tastes that enrich my life and all of our communities, I would argue, every day. I use turmeric and cardamom, cumin and mustard seeds as well as fish sauce and coconut milk, capers, chocolate, and cinnamon . . .pretty regularly. And they all work beautifully with our local produce and products. I am also a devout farmers’ market shopper and supporter of CSAs and generally try to purchase what we need (food and otherwise) as close to home as possible but with the above exceptions and a few more! Thanks to my current project with the USA Dry Pea & Lentil Council my global and local interests are converging nicely. I am working on some videos for their new, soon-to-launch consumer-facing website on how to prepare dry peas and lentils. I am testing recipes with yellow split peas, red lentils, whole dry green peas, garbanzo bean flour and much more, which is making me particularly grateful for culinary traditions world-wide. Indian and Italian preparations are serving me particularly well, but so are Mexican and French ones. So the fact that we grow such a huge variety of peas and beans in the U.S. that I can then prepare based on hundreds of years of cooking wisdom from far-flung places, climates and cultures is a joy. While I did not intend to post two recipes back to back with the same colors and almost the same spice-scheme, I hope you’ll consider them both. Soak the peas in ample warm water for 2-3 hours. Soak the rice in ample warm water for 1 hour. Drain both. Heat the ghee or oil in a large, heavy-bottomed skillet and add the cumin seeds. Cook just for a scant minute until fragrant. Be careful not to burn them. Add the rice and peas and stir to coat well with the fat. Add the Garam Masala, turmeric, cilantro and broth or water and 1/2 teaspoon of salt (unless your broth is quite salty–if you’re using water add a generous teaspoon of salt). Stir well, bring to a boil then turn down to a simmer and cook, partially covered for about 20 minutes. You may need to add more water or broth, in 1/2-cup increments if it seems too dry. When the peas and rice are tender and the liquid is absorbed let it sit off the heat, covered, for 10 more minutes to steam. While the peas and rice are cooking, stir together the relish ingredients. Serve the rice and peas with the relish and some yogurt, if you’d like. 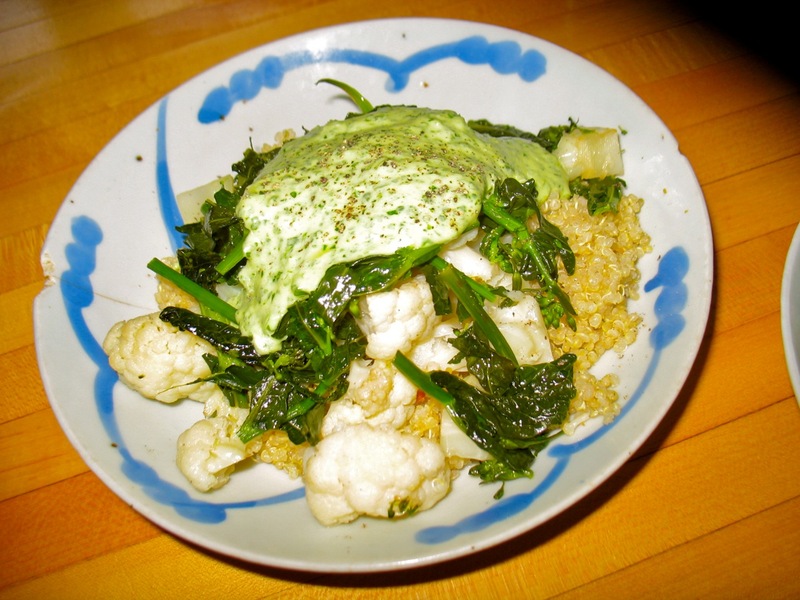 If you have leftover cooked or roasted cauliflower then this comes together in a matter of minutes. Heat 2 tablespoons oil in a large skillet over medium-high heat. Add the cauliflower and stir and then cook without stirring for a few minutes to let it brown a bit. Add a splash of water and cover the pan and continue cooking for another few minutes until the cauliflower is just tender when pierced with a fork. Add a little more oil if the pan is dry and then stir in the spices and let cook for a few seconds. Add the chickpeas and stir well and cook until just heated through. Make sure not to burn the spices so turn the heat down if need be. 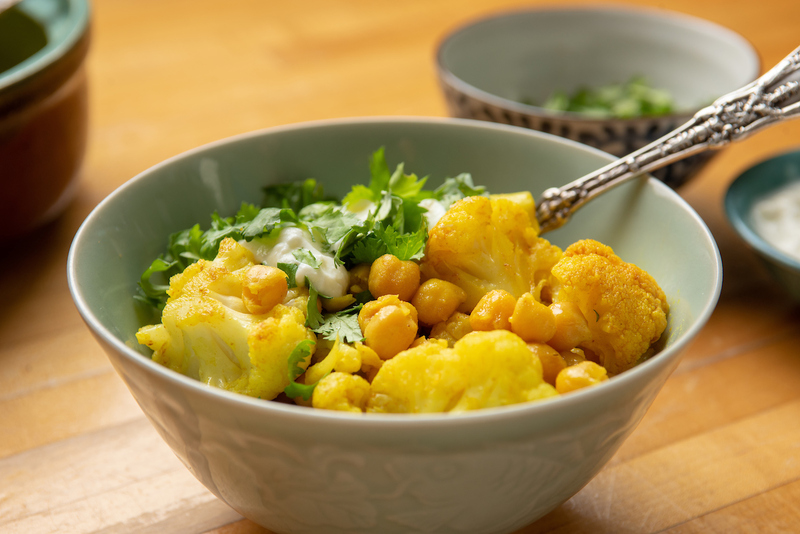 Season generously with salt and serve topped with cilantro and yogurt. 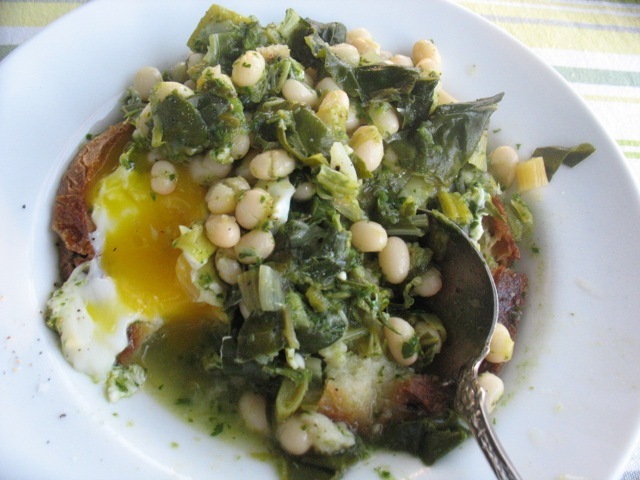 I learned how to cook fava beans like this from my friend Carol (of Ayers Creek Farm fame). Favas are a spring/early summer treat in our region and are only in the markets for a few weeks. They are often overlooked because most preparations have you shell them, then cook the beans and then peel each individual bean. And while the result is definitely worth it, it is a more labor intensive and time-consuming process than most veggies require. So since I learned the below method I enjoy far more fava beans each year. 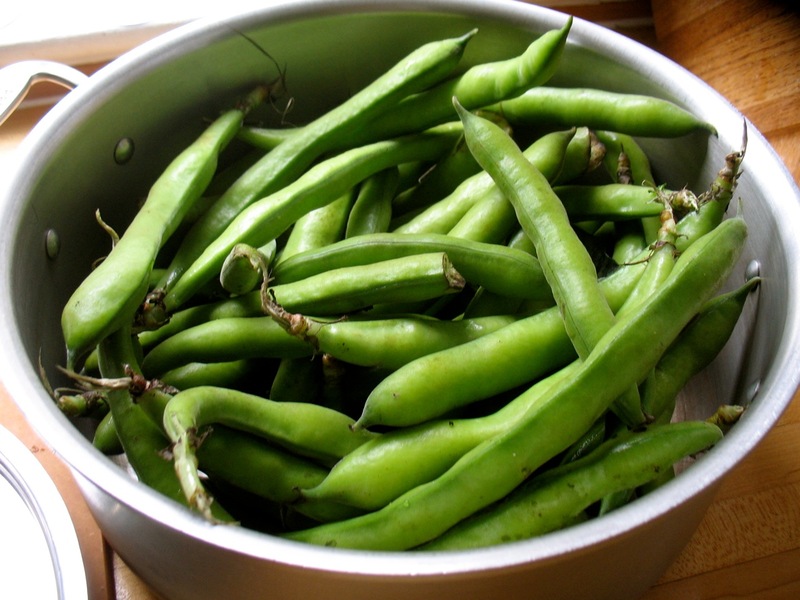 You cook the favas, big squishy pods and all in a large pot of heavily salted water until the individual beans start following out of the pods and then you don’t peel the individual beans. 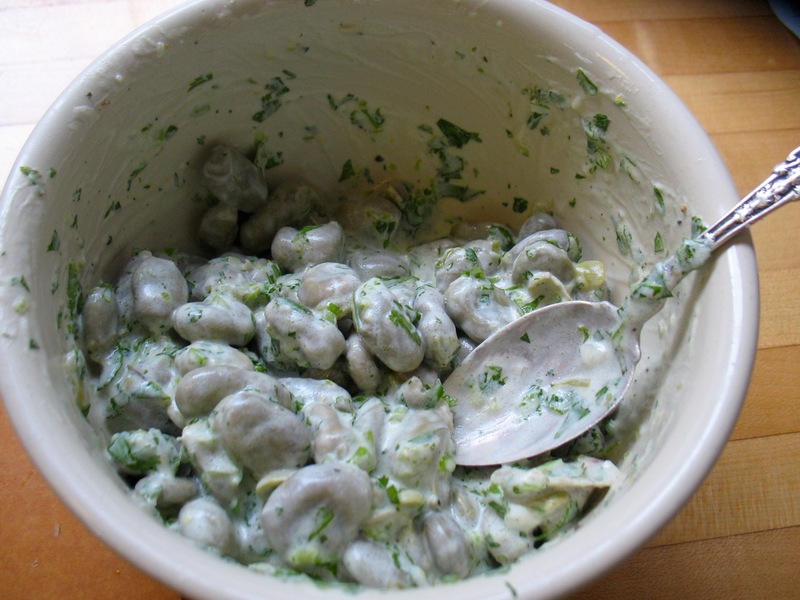 So if you like fava beans and wish you used them more, make this and report back. Curious to hear if you love it as much as I do. Fava beans cooked this way (and without the dressing) are delicious with pasta and a bit of parmesan, with boiled potatoes and parsley. 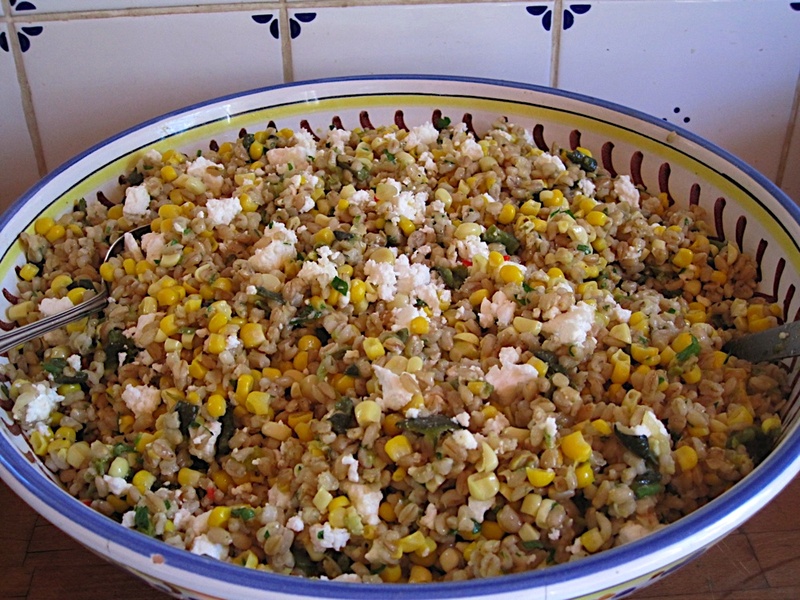 I’ve added them to Israeli couscous with some mint and grated, hard cheese. There are those who make a meal plan at the beginning of each week; make a grocery list for those specific dishes and then proceed through the week accordingly. It works for many, gives structure, reduces stress (for some) and has a certain order. 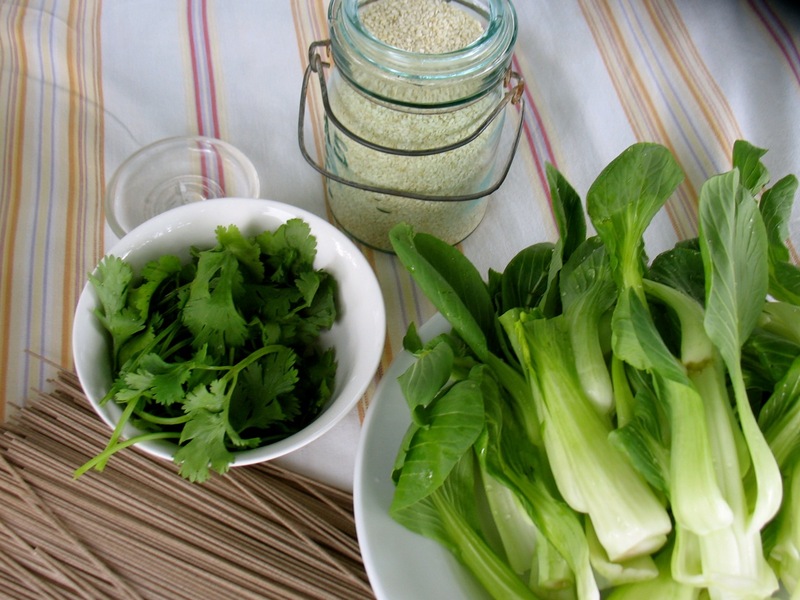 Soba noodles, bok choi, cilantro and sesame seeds–most of what I need to make this last minute dish. I’m decidedly not in this camp. I couldn’t begin to tell you what I might make five days from now. As you can tell from this blog, I’m the last-minute gal. I shop to restock my kitchen, not for specific recipes (with a few exceptions). And sometimes, like today, it’s a bunch of bok choi that was gorgeous at the farmers market on Saturday but is already looking a little worse for wear and two handfuls of cilantro that will be slimy by tomorrow that inspired tonight’s dinner. 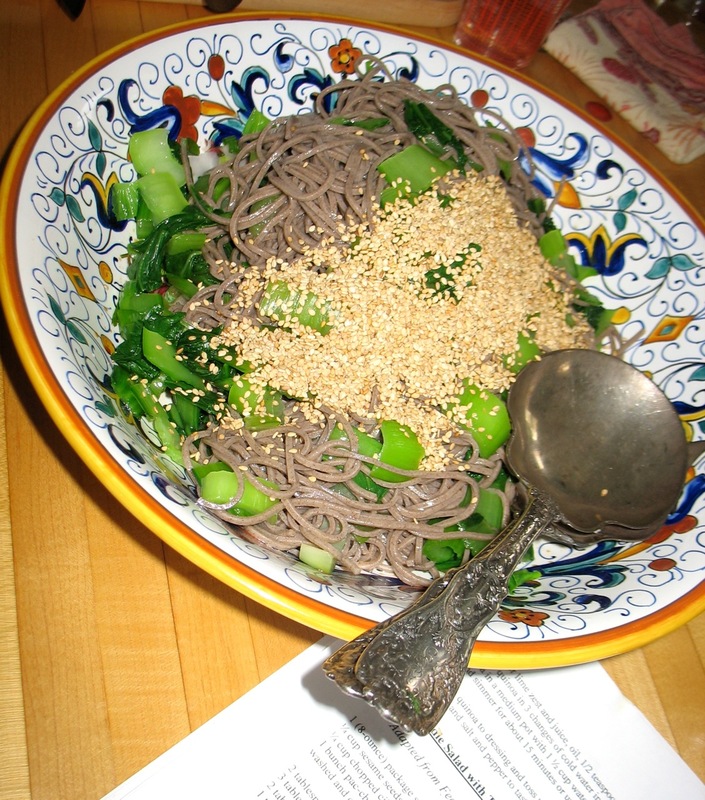 I have soba noodles and sesame seeds in the pantry and those are the other key ingredients for this cold soba salad. It’s a flavorful, good spring salad and with a couple of fried eggs on the side or a frittata will make a fine, light supper. And I should note that I do some planning, though in a very different, general/ad hoc sort of way. I cook extra beans and grains to freeze for later use, have veggie bouillon in the freezer, and sometimes have a few hard-boiled eggs in the fridge. And that, along with a well-stocked pantry serves me well since I usually enjoy the last-minute game of deciding how to use those veggies about to go south or that beautiful bunch of asparagus or the couscous my son loves. . . . And another note on the pantry and being stocked. It’s lovely having things like sesame seeds on hand, that after a quick toast in a dry pan, add a lot of flavor and texture to many dishes. Much like my last post about herbs, something as simple as a handful of sesame seeds can drive my decision about what to make for dinner. It doesn’t always have to start with the protein or starch or even veggie. Any key element of a dish can be the inspiration. Cook soba noodles according to package directions. About 3 minutes before the noodles are done add the chopped greens to the noodles, bring back to a boil and cook for a few more minutes. Drain and rinse noodles and greens in colander. Toast sesame seeds in a dry skillet over medium heat. Keep seeds moving until they give off aroma, pop, and begin to brown. This just takes 3-4 minutes. Remove and set aside. They burn easily so watch carefully. Mix dressing ingredients in large bowl, add noodles, greens and cilantro. Mix well. You can also add grated carrot, scallions, or choose to cook a different vegetable with the noodles such as broccoli, green beans, peas, etc. We’ve had some sun and warmth, albeit fleeting, here lately in the Pacific Northwest. And while it isn’t really warm enough yet to ditch the socks and shoes I’ve been cooking differently. Against all the weather odds the farmers markets have beautiful produce and we’re eating asparagus and radishes several times a week. Below is a quick review of some of my favorites from the last 10 days. Salad of avocado (not from the farmers market! 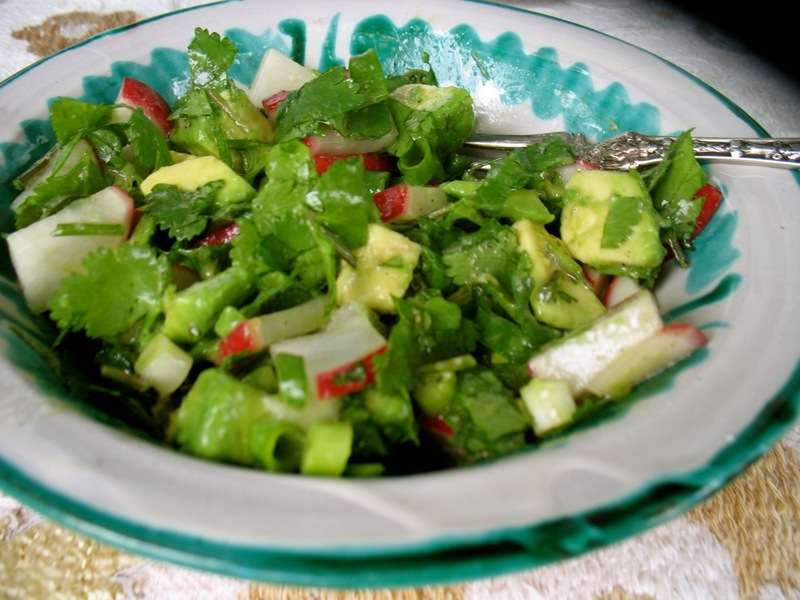 ), radishes, lots of cilantro, scallions and lime juice. I blogged about this dish last spring and had to make another mention of it. It’s not like risotto in that you don’t slowly add stock and stir as it cooks. In all other ways (excepting the grain itself) it is like risotto. It takes about 18 minute start to finish and is one of the most satisfying one-dish meals I’ve had in a while. 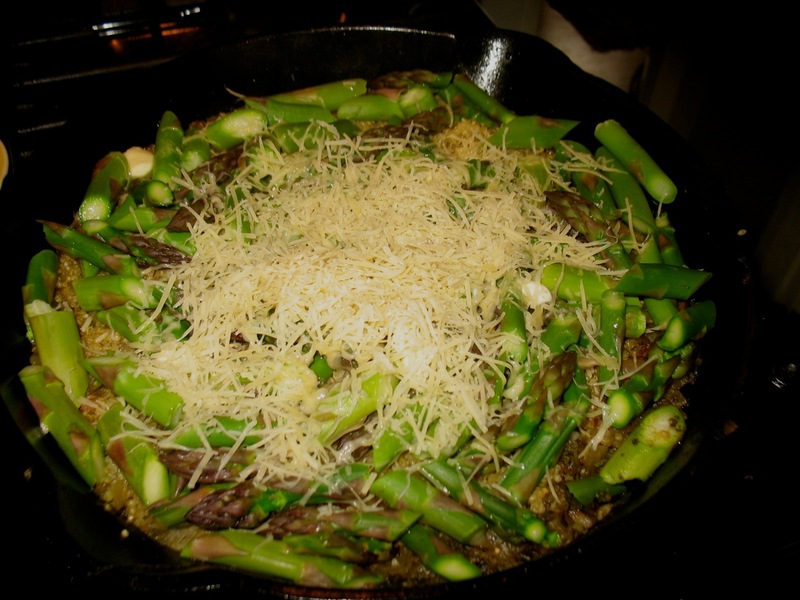 The quinoa is added to sautéed onions and a bit of diced bacon, then hot broth is added–cover the whole thing and cook for 10 minutes then spread the asparagus on top and cover again for a few minutes until tender. Then mix some grated parmesan and butter into the whole thing and voila! 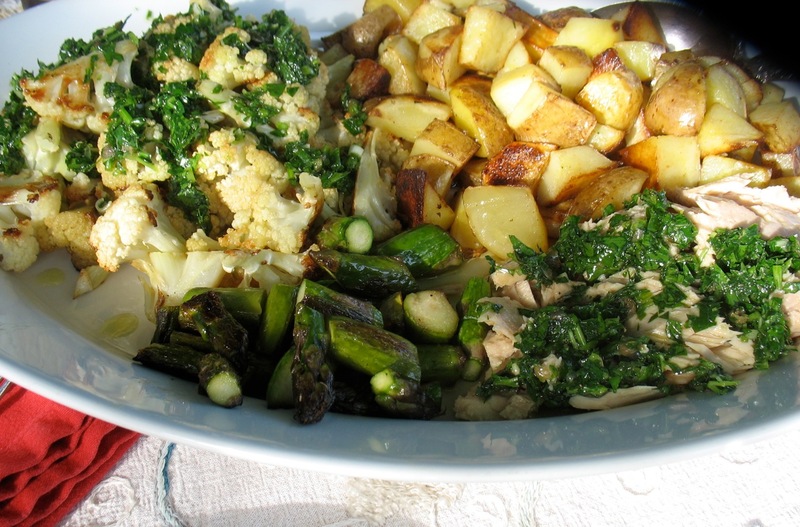 Roasted cauliflower and asparagus, canned Oregon albacore, fried potatoes and salsa verde. I make so many variations of this sort of meal. Roast or blanch or boil whatever veggies you have. Add some good canned tuna and drizzle the lot with salsa verde. Greens, beans, eggs, tuna, and cilantro yogurt sauce. 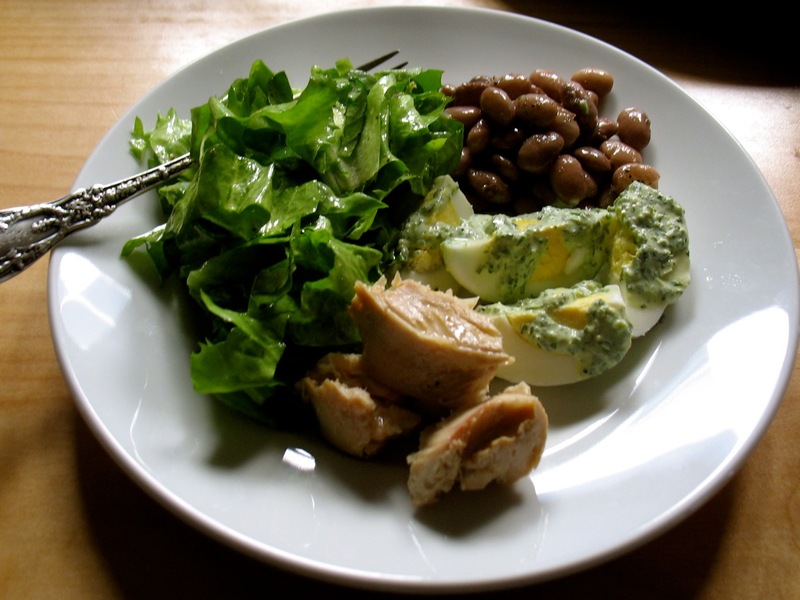 I guess this is the protein heavy version with home-cooked pinto beans, my favorite Oregon Albacore (from Stonewall Banks Seafood), hard-boiled eggs, greens and cilantro yogurt sauce. All of these meals were fairly quick, last-minute kind of meals and if you already have cooked beans and/or eggs all you have to do is make your sauce, dressing of choice or cook the quinoa and you’re set. As much as I love to cook, this time of year I’d rather spend more time in the garden or have a beer at the neighbors watching all the kids in the neighborhood chase each other down the slide in the early evening sun! 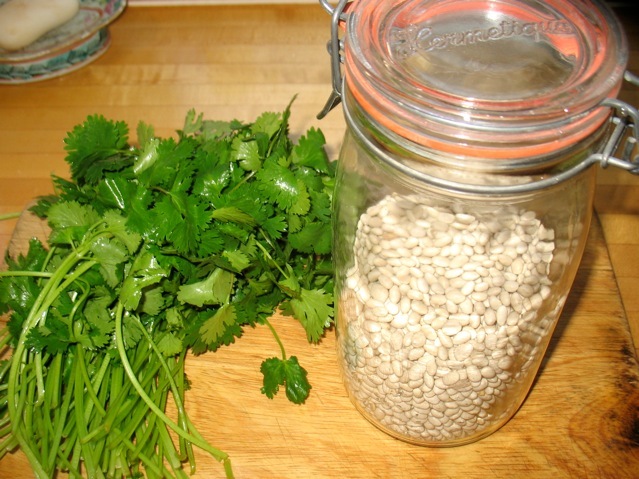 Posted on March 29, 2011 | by cookwithwhatyouhave | 1 Comment on What to do with that half-bunch of Cilantro? 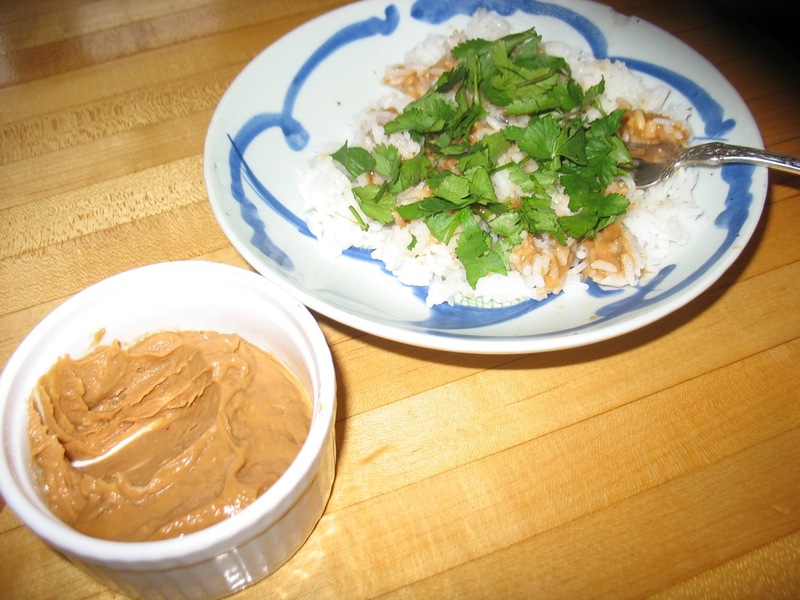 Rice with leftover peanut sauce and lots of cilantro. I have at least five different blog posts started in my head. These last few spring-like days here in Portland have been so energizing and glorious maybe that’s translated into increased brain activity. So I’d love to muse about all the birds I hear singing all of sudden every morning or the green garlic stalks that seem to have sped up their growth a bit or the late afternoon light or that wonderful springy, damp earth sort of smell. I’d also like to write about the talk I’m putting together to give at Slow Food Portland’s Annual Potluck this Sunday (there are still seats available and it is likely the best potluck in Portland and some of the most relevant content) I’d also like to write about several totally last-minute cook-with-what-you-have meals I’ve tossed together lately. So I think I’ll do the latter and focus on just one. The other day I was in need of a quick hearty meal for our family. I had leftover black bean soup in the fridge so I cooked a pot of white rice (I was in a hurry and I love white rice but tend to cook brown rice more frequently these days) to make the soup stretch. As I was heating up the soup I realized that this was going to be just one-too-many bean meals in a row for my husband. I’ve been doing a lot of recipe testing with beans lately and as much as my dear husband likes most of them I know he doesn’t love them quite as a much as I do. I rummaged through the fridge in search of some other quick inspiration for him and there was a little dish of leftover peanut sauce I had forgotten about. Then I remembered a blog post I had recently read by one of my favorite bloggers (David Lebovitz). Although primarily a baker he sometimes writes about savory foods and had posted a recipe for peanut sauce (that I have not tried) and talked about how he used to just dollop it on white rice for a quick meal on the go when he was still working in restaurants. So there it was: I had my hot rice, my little dish of peanut sauce and plenty of cilantro. So that’s what Brian got for lunch and he was very happy. I ate the bean soup AND a bowl of rice like his and had to agree that the latter was more fun! The hot rice loosened up the peanut sauce and brought out the flavors of lime and chili and the cilantro was cooling and lively. It hit the spot. So, if you make the below recipe for peanut sauce you should plan to use three-quarters of it to toss with some spaghetti or rice noodles and some finely sliced raw veggies and save the remainder for the above dish! 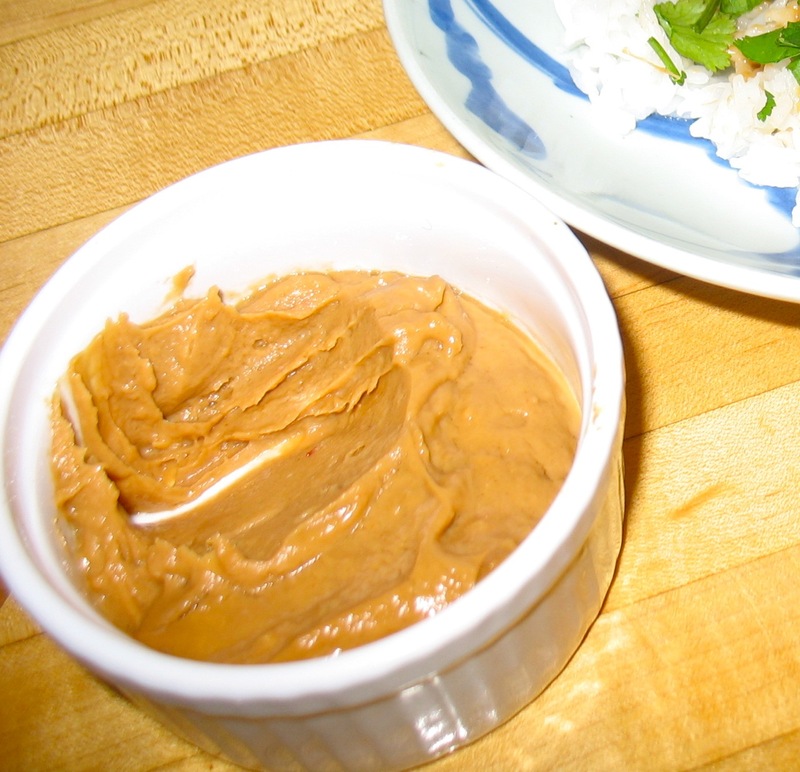 I have come to love this particular peanut sauce that I came across on another food blog I follow–Skillet Chronicles–by Aleta Watson. Thanks all you fellow bloggers for the constant inspiration! I wish I managed to assemble blog posts with beautiful photos that illustrated the step-by-step process of each dish, but on second thought that’s not often how my cook-with-what-you-have nightly cooking unfolds so I might as well keep it realistic. And with a tired and hungry pre-schooler underfoot, photos often just don’t happen. So I’ll keep enjoying those beautiful blogs and offer you something else–a slightly more slap-dash account of meals I think are worthy of sharing and other stories. Chard, leek, white bean and cilantro soup over garlicky toast, topped with a poached egg–that you poach right in the soup. Whether this is the best soup or not, it is my current favorite soup. It’s a slightly unusual combination of things and comes together into one of the most satisfying and complete meals, warming body and soul on these cool, stormy evenings. It is basically stewed leeks with white beans, veggie broth, chard and pureed cilantro served over toasted bread you rub with garlic and then top with a poached egg (that you poach right in the soup). The bread and the egg take this dish to its exquisite level. However, I’ve enjoyed leftovers of this soup without bread or egg and just a generous drizzle of good olive oil, very much. Two things that make this soup especially good are good beans and homemade veggie bouillon. The former I talked about in my last post and the latter is easy to make. As you all know I’m a bit evangelical about this veggie bouillon. I’m actually considering making it in quantity to sell so stay tuned. It has made my daily cooking easier, better, more economical and definitely more fun. You can certainly use any stock or broth or even water and beans (dry or canned) from the store to good effect. Just make it! It’s a wonderful antidote to the sweet richness of the other foods this time of year. Finally, my Kitchen Fundamentals, Pantry Stocking 30-Minute Dinners series is filling up quickly so if you’re considering it for yourself or as a gift, let me know asap. Happy Cooking and Eating and Celebrating! Cook the beans in water with one clove of the garlic until soft. (See bean cooking instructions here) Drain and set aside. You could also use canned beans. Trim and clean the leeks. Cut in half, lengthwise, and slice in 1/4 inch slices. Heat olive oil in a large pot. Sauté the leeks in olive oil until limp. Add three cloves of garlic, minced. Continue sautéing until the garlic is soft but not brown about 2 minutes, lower heat as needed. Add four cups of the stock and bring to a simmer. Add the beans and continue to simmer for a minute or two. 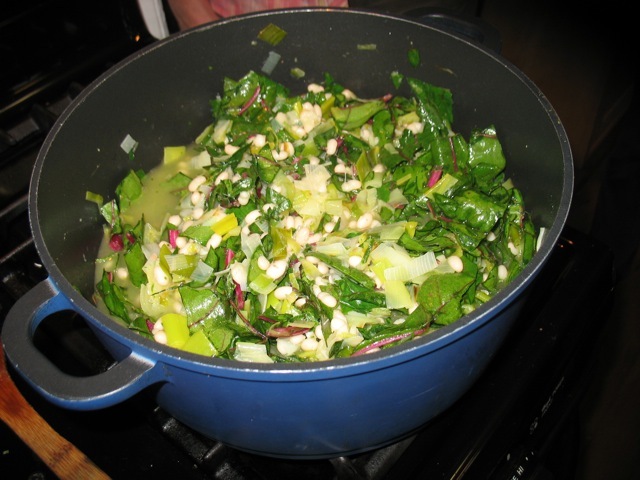 Add the chard to the pot and cook for a few minutes. 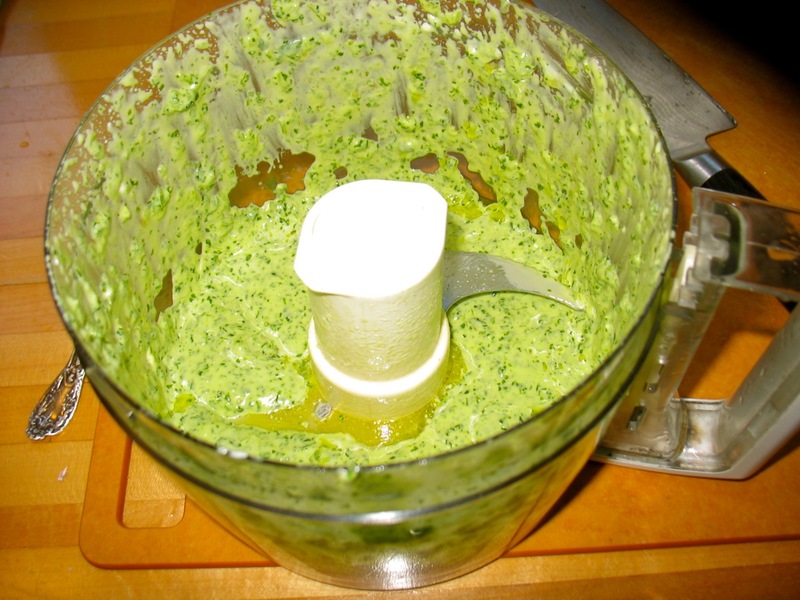 Blend the cilantro with the reserved 2 cups of bouillon in a blender. Add the cilantro mixture and season with salt and pepper. Bring mixture to a rapid simmer. Crack eggs into soup, cover and let poach about 5 minutes until the yolks and whites are just set. While eggs are cooking toast the bread slices and rub with remaining garlic cloves. You can rub one or both sides of the toast with garlic–depending on much you love garlic. Lay the bread in the bottom of a soup bowl. Ladle the soup over. Top with poached egg. Drizzle with good olive oil and grind some pepper over the top. The Last of the Corn, Peppers. 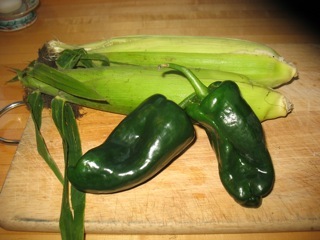 . .
Posted on October 15, 2010 | by cookwithwhatyouhave | Leave a Comment on The Last of the Corn, Peppers. . . I first made this salad almost a month ago as part of the dinner I catered for a forestry conference my mother hosted. It was well received and prompted my brother (the one who recently got married) to tell me that he wished I would have catered his whole wedding. 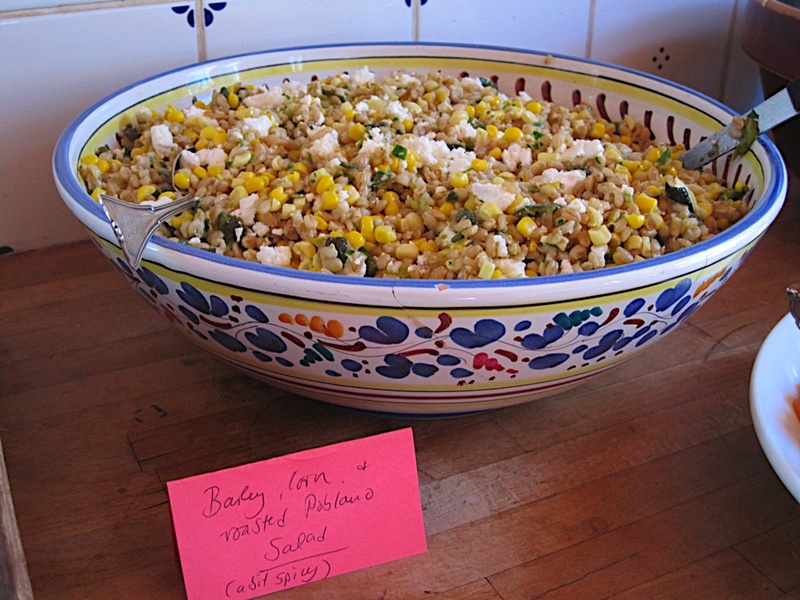 I say this in part because I was thrilled to finally have created a barley salad worth writing about unlike this attempt you might remember. So if like me, you’re trying to get the most of late summer treats like corn and peppers give this a try and let me know what you think. And I just might try a winter version of this hearty dish when I fully embrace the colder seasons. *Note: I used hulled barley which, unlike pearled barley, has only had the outer layer removed and the bran layer is still intact. It’s delicious and full of good fiber but does take a little longer to cook so depending on what kind you’re using adjust your cooking time. ** Poblano peppers vary widely in their level of heat/spiciness. Taste them as you go and you may not want to use as many as I suggest if they’re really spicy. Final note, if you’re using sweet peppers and are in a hurry you can skip the roasting step and just dice them. The roasting adds a wonderful smoky richness but the salad is still good with fresh peppers. If you’re using hulled barley add it and 4 cups of water to a pan with 1 tsp kosher salt. If you’re using pearled barley, add only 3 cups of water. Bring to a boil then turn down to a simmer and cook for about one hour for hulled and 45 minutes for pearled. Test to check for doneness. You want it to be soft but with a bit of a bite still, not mushy. It’s pretty forgiving though and firms up a bit as it cools so don’t worry too much. Remove from heat and put in a large bowl to cool. Meanwhile roast the peppers under the broiler or directly on your gas flame until blackened and blistered on all sides. Set in a bowl and cover for a a few minutes to cool and loosen the skin. When you’re able to handle them remove the skin, stem and seeds and roughly chop. Cook the corn kernels with a splash of water and several pinches of salt until just tender, about 5 minutes. Mix all the dressing ingredients. 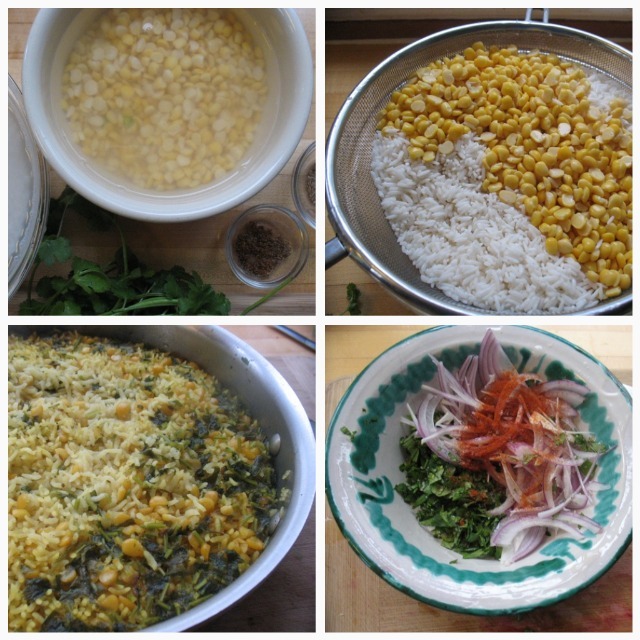 Add corn, peppers, cilantro or parsley (if using) and dressing to barley and mix well. Then add the feta. Add salt, lemon juice or cumin to taste. The barley soaks up a lot of salt and acidity. Note: It’s easy to cook barley in larger quantities ahead of time and freeze for super quick meals like these. I used to buy Salad Rolls for lunch when I worked downtown from one of my favorite food carts. They were fresh and inexpensive and the peanut sauce was addictive. And I didn’t have to wait in line since they were ready-made and I always had exact change. Sounds pretty rushed for the devoted “Slow Foodie” that I am. . . . but sometimes work called! Now many years later, I’ve finally learned to make them. 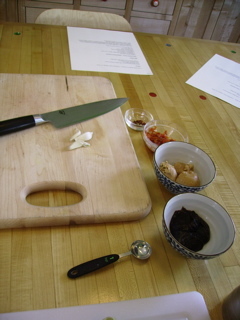 I held a private cooking class this weekend and was asked to teach an Asian-inspired menu. 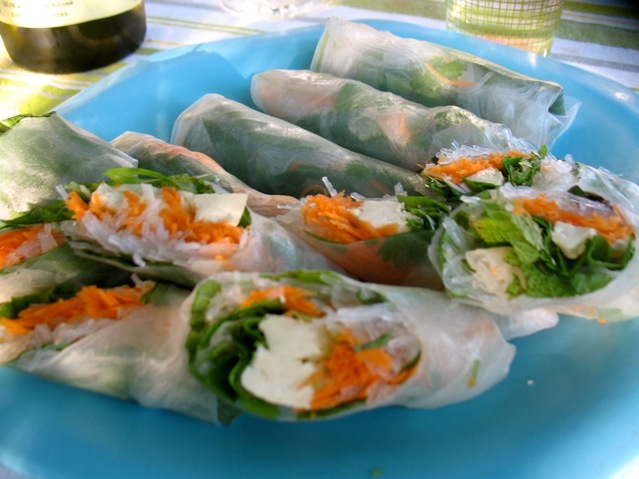 Salad rolls were the first thing that came to mind so that was our starter. This dish brought with it a conversation (mostly with myself) about using local produce. My classes/menus (and my everyday cooking) are driven by the produce I buy at the farmers’ markets. All of a sudden I found myself wanting/needing basil, mint, and cilantro–none of which are at local farmers’ markets right now. I bit the bullet and bought these things at the grocery store. I actually buy cilantro at the grocery store occasionally without giving it much thought but not the basil and mint. I grow both, but the mint is barely peeking out of the ground at the moment and of course the basil is months away. Now I do buy oranges and bananas in the winter and plenty of other non-local staples but because of the plethora of wonderful veggies that do grow here year-round, I’ve never really bought much produce out of season. I’m bemused and interested by my mental games and parameters I’ve somewhat unwittingly developed. More on this in a later post and I’m curious to hear your thoughts on the subject. . . .
My conclusion, post salad roll making and eating, is that a) I’ll plant more basil this year, and add cilantro to the mix (hoping it doesn’t bolt too fast) and b) I’ll occasionally indulge in salad rolls out-of-season too. They were just so good and so light and fresh after months of heavier winter fare. One of my early attempts – before I wised up and skipped the lettuce and just used herbs. Much tastier and easier to roll. So, now to the recipe. I adapted recipes from Gourmet for both the rolls and the peanut sauce. I made enough changes that I’m posting my versions here, but here’s also the original in case you’re curious. In a bowl soak noodles in very hot water to cover 15 minutes and drain well in a colander. With scissors cut remaining noodles into 3 to 4-inch lengths and in a small bowl toss with vinegar and salt to taste. In a shallow baking pan or cake pan soak 2 rounds rice paper in hot water to cover until very pliable, 45 seconds to 1 minute. Lay a dry dish towel on a large, flat dinner plate. Carefully spread 1 soaked round on it and blot top with other half of dish towel. Peel paper off and place on plate (it will stick to the towel if you leave it on the towel). Leave remaining round in water, and blot with dish towel. Arrange several basil leaves on bottom half of sheet, leaving a 1-inch border along edge. Top basil with about one-fourth of noodles, arranging them in a line across lettuce. Top noodles with one-fourth each of scallion, carrot, tofu, and cilantro and mint. Roll up filling tightly in rice paper, folding insides after first roll to completely enclose filling, and continue rolling. Blot remaining soaked rice paper round on dish towel and blot other side then move to the plate. 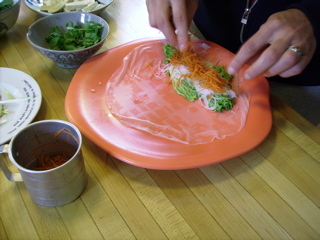 Wrap rice paper around spring roll in same manner. (Double wrapping covers any tears and makes roll more stable and easier to eat.) 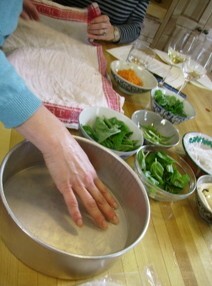 Wrap spring roll in rinsed and squeezed dish or paper towel and put in a resealable plastic bag. Make 3 more rolls with remaining ingredients in same manner. Rolls may be made 1 day ahead and chilled. Before serving, bring rolls to room temperature. Halve rolls diagonally and serve with spicy peanut sauce. In a small saucepan cook garlic and red pepper flakes or Serrano and ginger in oil over moderate heat, stirring, until garlic is golden. Whisk in remaining ingredients (except lime) and bring to a boil, whisking. Simmer sauce, whisking, until thickened, about 1 minute. Remove from heat and whisk in lime or lemon juice. Sauce may be made 3 days ahead and chilled, covered. Serve sauce warm or at room temperature.